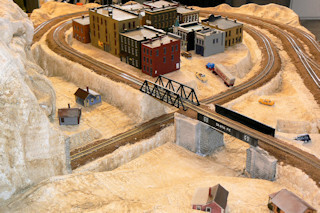 Welcome to part 6 of a series of articles on my N scale model train layout.There are links to other articles in this series at the bottom of this page.For those who have read or glanced at the previous articles, you cansee from the photo at right that I have completed a number of town buildingsin the track loop to the right and a large factory building in the trackloop to the left.I have set out a few cars and trucks to get an idea where the roads will go.At the front of the layout is a prebuilt Walther's Cornerstone series passenger terminal building, next to a river gully with a few timber track supports. This photo shows the factory side of town.The "Kitt Transfer" building is a 1950's looking brick buildingfrom Woodland Scenics.The smaller shotgun shack and company house in the foregroundare laser cut wooden models from American Model Builders.Both of these have been blasted with dust and rust powdersfrom Bragdon Enterprises.They make a nice kit with 12different colors or instant weathering powder. The trucks are nifty pre-painted die-cast models from Classic Metal Works.And the cars are resin models from NuComp Miniatures.I will get more models from NuComp. 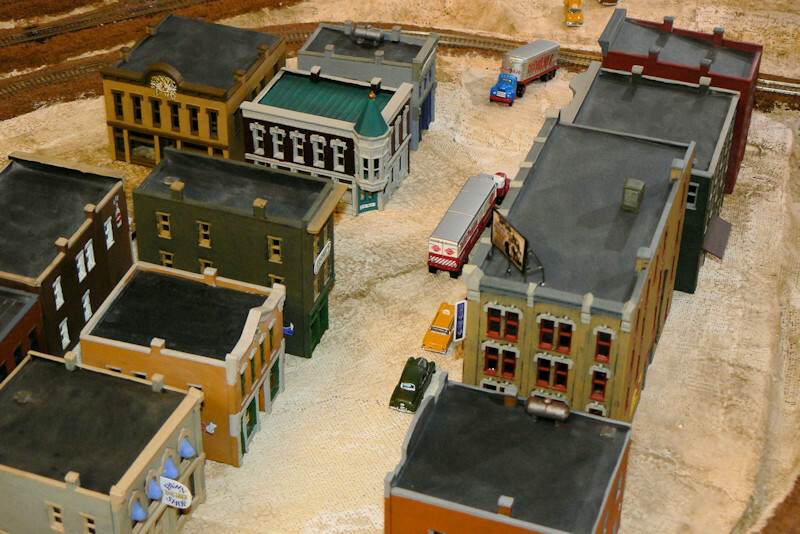 I intend to add a low rent trailer parkto this side of town. 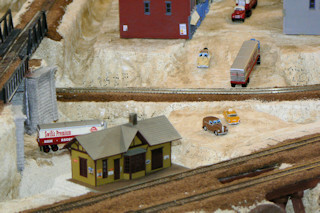 This photo shows the road leading to town.The taxi and the trucks are die cast metal models.The other cars are resin models I painted.The foreground has a closer look at the passenger depot. 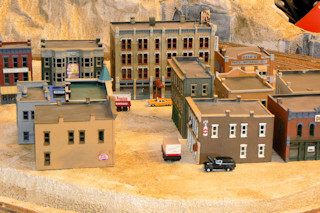 This photo shows an overview of my town.These town buildings are all supplied with WoodlandScenics Scenic Ridge Town and Factory kit.The kit comes with some fun doodads that you canadd to the buildings like sign decals, canvas awnings,billboards and various vents and tanks. The biggest building in the kit is the factory, followedby the hotel building shown in yellow at the right side. (The one with the billboard on the roof. 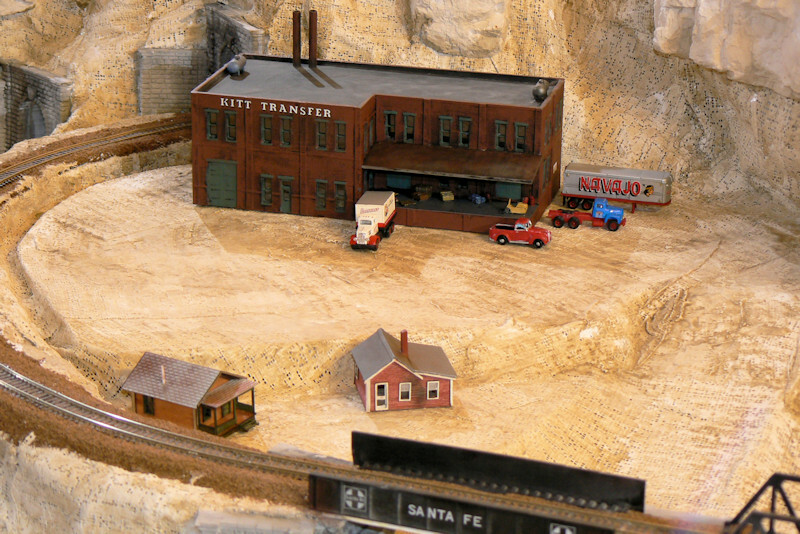 )Once again, I used the Bragdon Enterprises weather powders to make the roofs a bit dusty and aged looking. This is a part of town I call Junction Street. It does not go anywhere,but it forms a junction in the center of town.Nearest the camera are the bank and the bar.A Falstaff beer truck makes its delivery. It is a bit difficult to see, but all the buildings haveclear plastic windows.The interiors have a sheet of black paper to block the see-through effect.Unfortunately all the windows appear blacked-out in this photo.At least you cannot see from one side of the building to the other. Here is a reverse angle view of the town.It's the view you would see if you were N scale height and you climbedone of the mountains on the back of the layout.From here you get a nice view of the steel plate bridge with the Santa Fe logo.You also get a clear view of nearby grubby town.Hopefully more trailers are coming to provide low rent housing. 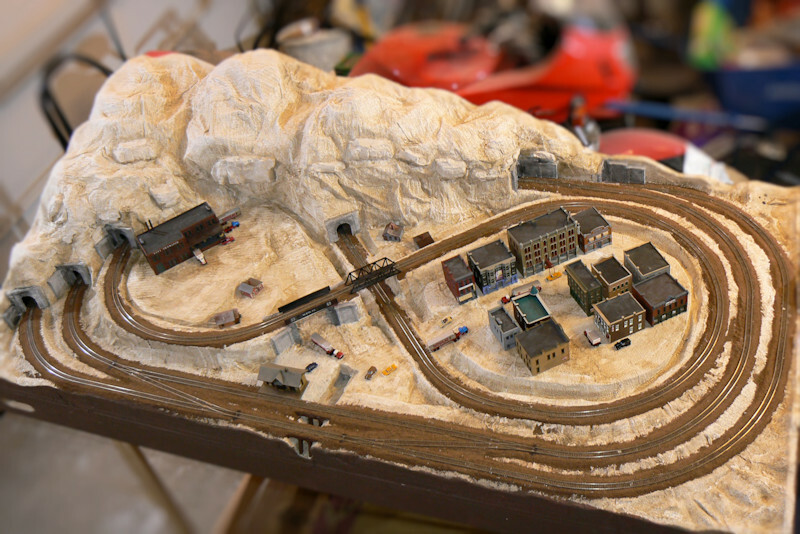 The town has somewhat of a moat surrounding it.At this point I do not know if I will let it stand and fill it with model water.Or perhaps I will fill it in and make more room for models. Who knows. The next step is to add a few roads and start growing some vegetation.Right now it looks like a dusty dry town. More to come! Last modified: Thursday, 09-Jun-2011 13:06:46 MST.